A former Russian state security officer and a cyber-security expert were both sentenced to long jail terms for treason Tuesday in a murky case that has attracted speculation it could be linked to the 2016 U.S. election. 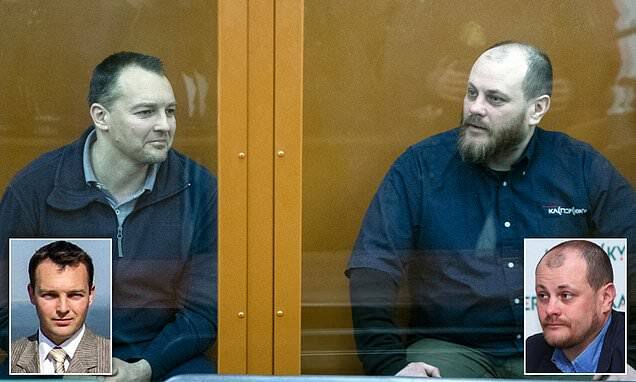 Sergei Mikhailov was sentenced to 22 years in a maximum security prison and Ruslan Stoyanov to 14 years in a similar facility after several months of evidence and arguments in a trial held behind closed doors. The two were arrested in December 2016 shortly after the United States accused Russia of trying to influence its presidential election through computer hacking, an accusation Moscow denies. The timing led some people to suggest the actions were linked to the possible mole who tipped off U.S. intelligence agencies about alleged Russian interference. Researchers in the cyber security field in both countries believe Moscow intended the arrests as a signal, in response to the U.S. hacking accusations, that it would now take action against forms of cooperation that it previously tolerated. Mikhailov used to work at the security center of Russia's Federal Security Service (FSB), while Stoyanov was the head of the computer incidents investigation team at Russian cyber-security firm Kaspersky Lab. The DailyMail.com exclusively reported in April 2017 how Mikhailov faced the treason changes evidently linked to leaks giving US investigators the knowledge that Vladimir Putin's intelligence services hacked and meddled in the American presidential election. Mikhailov was arrested in December during a meeting of senior officers at the agency's Lubyanka HQ in December 2016. A bag was placed over his head and he was frogmarched from the room in handcuffs. On Tuesday the two men listened to the verdicts and sentences from a glass cage inside the courtroom, flanked by masked men.